recruitment of TN MRB written exam. There are total 1884 vacancies available in this TN MRB Latest recruitment 2018. Eligible candidates submit application form online on or before 15/10/2018 via the official website of MRB of Tamil Nadu @www.MRB.TN.gov.in. This Assistant Surgeons recruitment of TN MRB will be conducted through personal interview and certificate verification. See the below given details for age limits, online application process, fee details, important dates and more for TN MRB Assistant Surgeon Specialists recruitment exam 2018. Click here to see the official notice of TAMIL NADU MRB Assistant Surgeon Jobs Recruitment. Post Name-Assistant Surgeon -1884 Posts. The candidates must have qualified MBBS and should have completed 1 year house surgeon training. And candidate must have registered with the Madras Medical Council. The candidate's upper age limit as on 01-July-2018 for SCs, SC(A)s, STs, MBC&DCs, BCs, BCMs is 57 years and for remaining candidates upper age limit is 35 years. Selection for this TNMRB Assistant Surgeon recruitment will be held based on marks secured in educational qualifications and personal interview only. There is no written test for TNMRB Specialists Assistant Surgeon Jobs. Application fee is Rs.750/- and for the SC/SCA/ST/DAP(PH) candidates application fee is Rs.375/-, bank charges will be applicable. Eligible candidates can apply through the Medical Services Recruitment Board website of www.MRB.TN.gov.in online only. Click on online registration and select the post name and fill all the posts and upload the image and signature as per given sizes. After completion of application form online submit it and update the fee payment details and submit finally. Then take a print out of filled application copy and at the time interview with TN Medical Services Recruitment Board the candidates has to submit the application copy along with all required documents. For any details write your query to below given address. 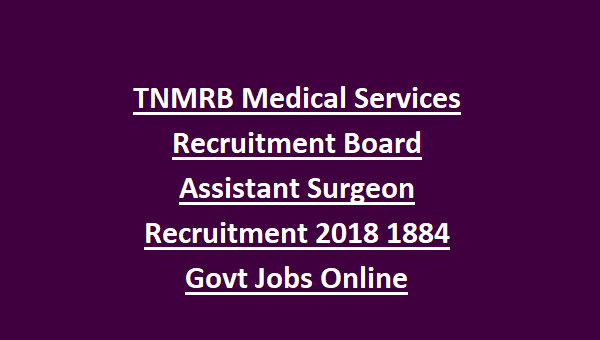 Click here to apply online for the TAMIL NADU MRB Assistant Surgeon Speciality Recruitment 2018. 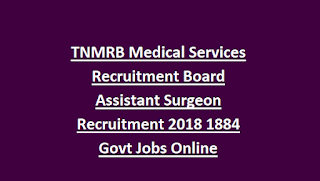 Please share this TAMIL NADU MRB Assistant Surgeon Jobs Recruitment Examination 2018 article to your friends via social pub sites such as Facebook, Google Plus and Twitter.